Beautiful statue modelled on the Paper Mache Statue which enshrines the Sacred Body of St Philomena within the Sanctuary in Italy. 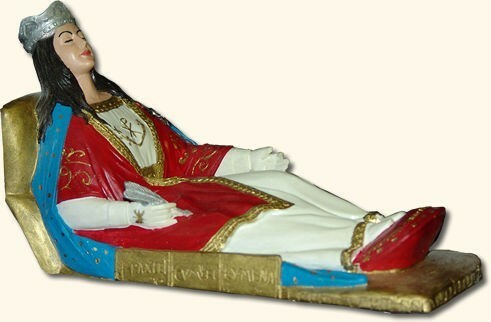 This coloured statue in a sleeping position is a traditional depiction in Southern Italy of how Saint and Martyrs are enshrined. This particular model has been designed with the crown, palm and the tiles from the catacombs of St Pricilla in Rome which says: PAX TECUM FILUMENA. Handmade and hand painted in Italy. Good quality product.